Prepared in July 2018 by the Institute for Research on Poverty (IRP), University of Wisconsin–Madison. See also IRP’s Frequently Asked Question: What are good sources of demographic and socioeconomic information for states, counties, and cities? A quick overview of the basic demographic census statistics of Dane County. The SSRC is an ever growing virtual portal of research on low-income and TANF families and an online hub for professional networking among researchers, policymakers and practitioners who serve these populations. This document, prepared by the United Way of Dane County, contains a summary of 16 community plans that have been developed in Madison and Dane County in the last few decades. Specifically, the document identifies key aspects of alignment in the plans and then categorizes the recommendations of various groups in order to easily compare community priorities across all of the plans. This report describes depth and breadth of racial disparities that differentiate the white and black experience in Dane County. These racial disparities, which are more extreme than in many jurisdictions across the state and nation, permeate many measurable aspects of life in Dane County including education, poverty, youth incarceration, unemployment, and health. This report is a response to the 2013 Race to Equity Baseline Report, and calls upon all sectors of the community to work toward three overarching and inter-related goals: increasing employment, income and wealth of Dane County’s low-income families of color; expanding and improving supports for low-income working families of color; and expanding and improving supports for children and youth of color. What makes it difficult for families to get ahead financially in Dane County? What could help families decrease their expenses or increase their incomes? These are the key questions of the DreamUp WI challenge, and understanding the needs of the Dane County community and which solutions will work for community members is crucial to our success. 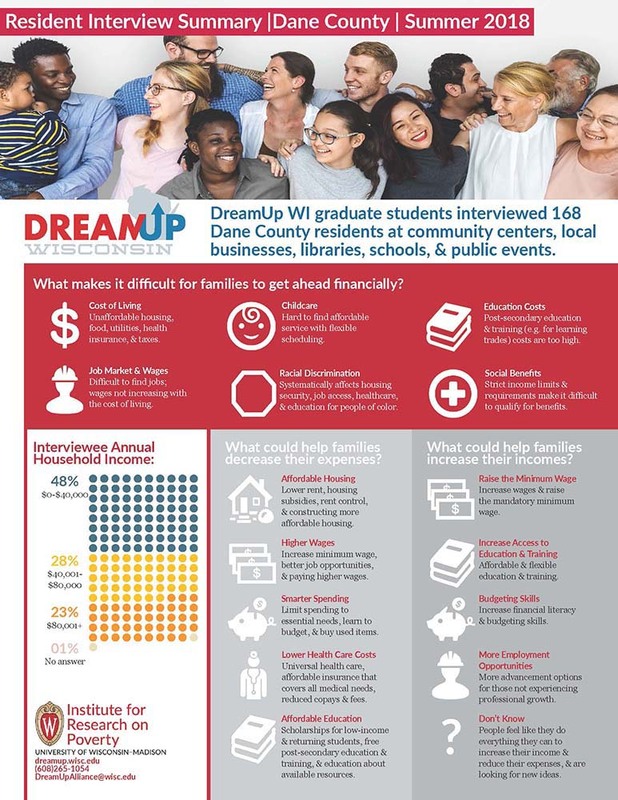 DreamUp Wisconsin graduate students spent the summer interviewing 168 Dane County residents at community centers, local businesses, libraries, schools, and public events to get their answers to these questions. Their findings are summarized in a flyer.